Use shim kits to properly align pulleys. 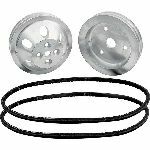 Water pump shims have dual bolt hole pattern to fit most GM and Ford water pumps. Crank pulley spacers are for small block Chevys. Kits include three shims.